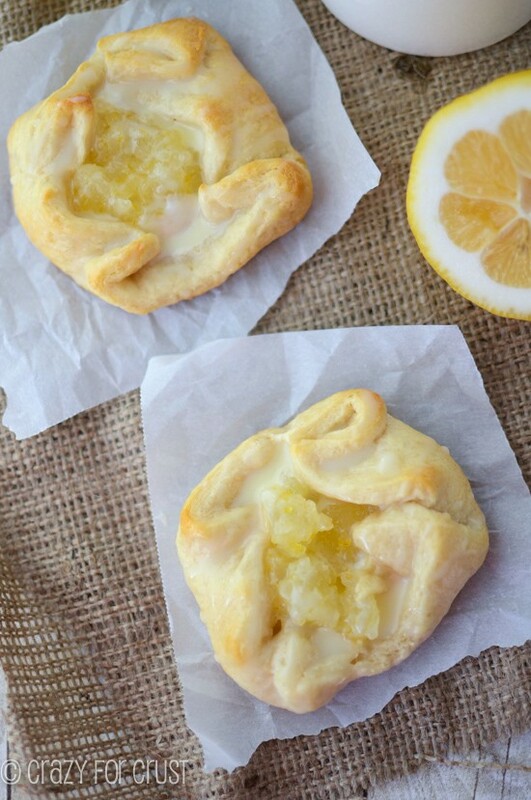 This Easy Lemon Cream Danish is the perfect breakfast! 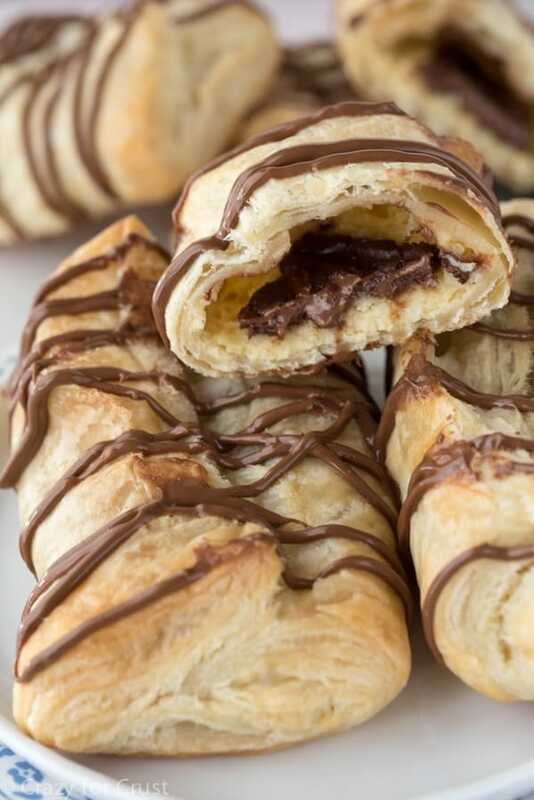 These are done in minutes using Pillsbury Crescent Rolls, perfect for on the go. Last Saturday night we took Jordan to her first concert: Zendaya at the state fair. She was SO excited, because Shake it Up is her favorite show. I must say, attending a tween concert at a state fair is very…interesting. You have all the girls and piercing screams, of course. That’s to be expected. So is the obligatory adult with each pack of girls. And then you have those adults. The ones that are a little too into a concert sung by a 16-year-old with band members mostly younger than her. Really, if you’re over the age of 25 and have a pack of tween girls with you, then (1) you are too old to wear a tube top and daisy dukes, (2) you really should cut down on the beer you get at the beer garden beforehand and (3) standing on your chair is not appropriate. Also, if you happen to be watching from the bar next to the grandstand, and I rush by you on my (third) trip to the potty with a tween, I will blog about you if you’re totally rocking out Madonna style, eyes closed, with your (I assume) 5th very full glass of red wine. I mean…I know it’s a state fair. But it’s a kids concert. The combination of so much alcohol and kids was strange for me. After a late night, we needed a yummy breakfast. 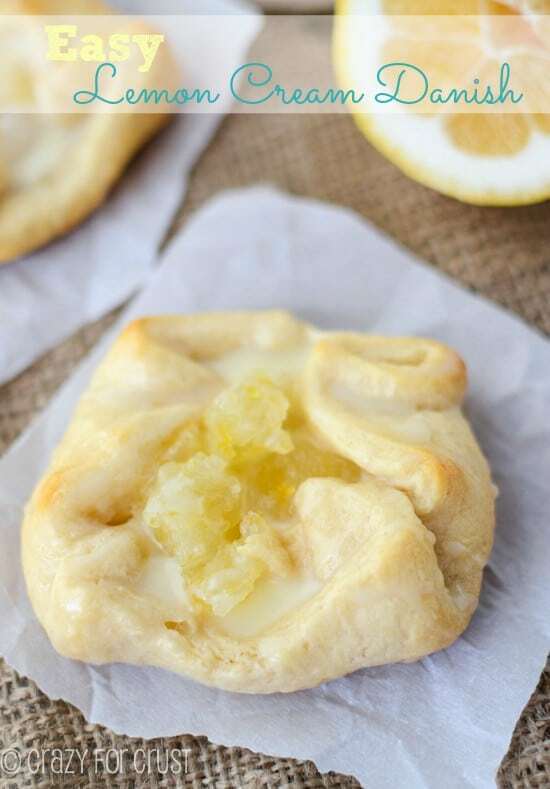 These Easy Lemon Cream Danishes are the perfect wow breakfast…but they are super easy to make. Perfect for when you can barely open your eyes because the kids woke up at 5:30…after going to bed at 11. 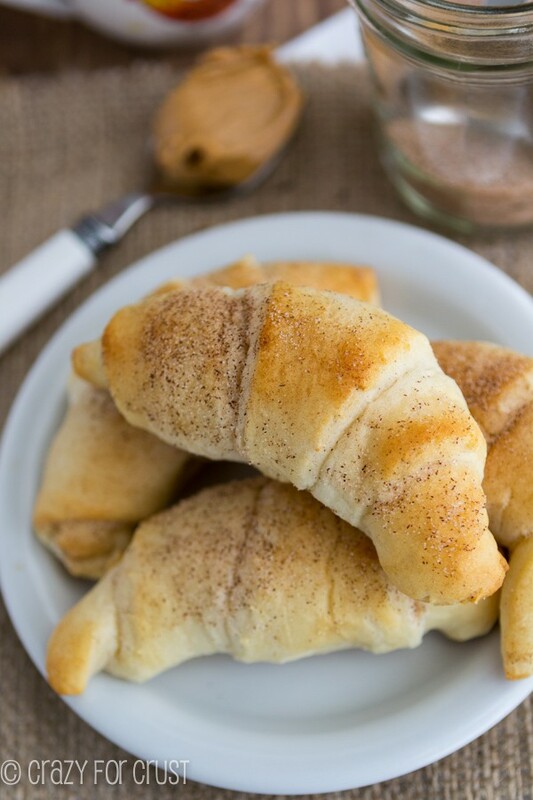 These danish are so easy to make because they are made using Pillsbury Crescent Rolls. I have a slight addiction to those tubes of crescents. I buy them way too much, and eat them way too often! They just make everything easier. Let’s break down these danishes, shall we? The base is the crescent roll. You unroll the rectangle and pinch together the seams, then cut 8 squares out of it. The roll is topped with a creamy mixture of Greek Yogurt (vanilla nonfat is what I had, use what you like!) and a little sugar for sweetness. 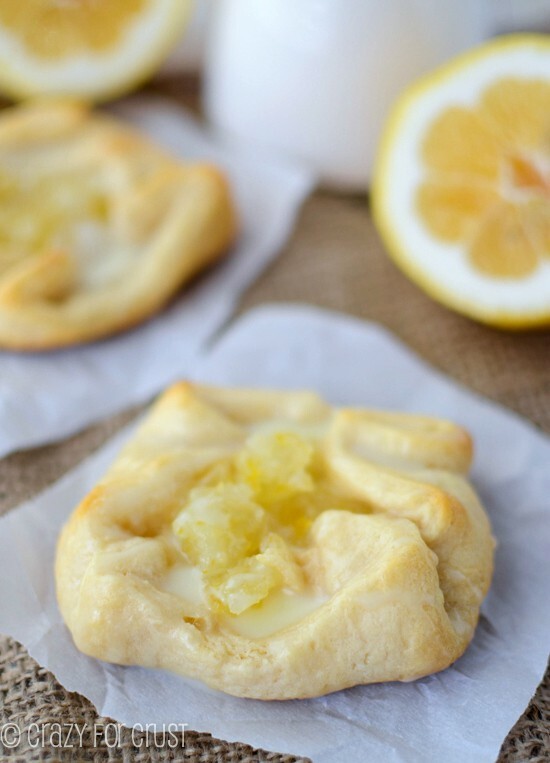 Then I added some lemon curd on top…because they’re lemon danish. Now, let’s talk lemon curd. You can use a jarred curd for this recipe, if you’d prefer. That would certainly be faster and more convenient. But if you have the time, and the lemons, you should totally try making it from scratch. It’s not that hard to do, and it’s really, really good. I have a lemon curd recipe that I made last year, that’s a traditional curd recipe, using eggs. But I was running low on eggs last weekend, with lots of baking to do. So I made an eggless lemon curd instead. The recipe for the eggless curd is from my friend Keri at Shaken Together. It’s really good, not as smooth as an egg-based curd, but it’s butter and egg free. That means I can eat more! The lemon curd gets layered on top the cream layer, the crescent rolls get folded up around the filling, and then they get baked. 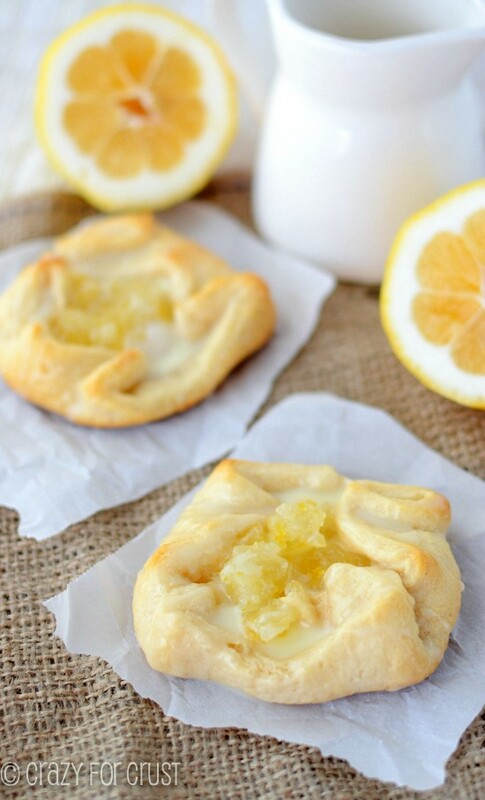 The perfect lemon danish! Oh, and one more thing: glaze. Danishes must have some sort of glaze! I was making muffins (recipe soon!) at the same time, with a white chocolate glaze. The glaze made a lot, so I used it for both recipes. It’s a white chocolate ganache drizzled over the top of the danishes. Yes, I said white chocolate ganache. 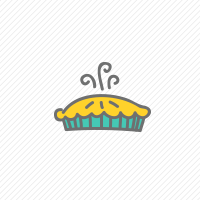 On a lemon danish. Oh, yeah! It’s the triple threat danish. These are the perfect easy breakfast for those “I need a danish day.” Or the “My ears are still ringing” day. Or…any day! 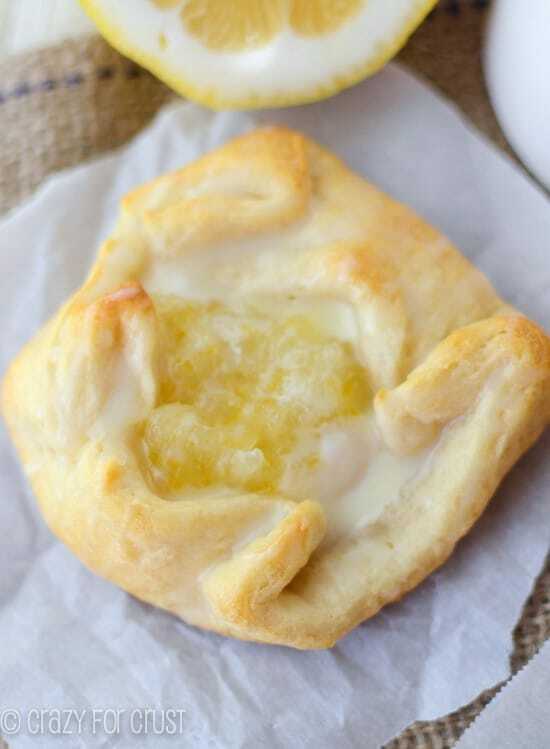 These easy Lemon Cream Danish start with crescent rolls and an eggless lemon curd you can make in the microwave. Or, start wit jarred lemon curd to make them even easier! These are a great brunch recipe! Make the Lemon Curd (optional - you can also use jarred): Mix sugar, water, and cornstarch in a medium saucepan over medium-low heat. Whisk together until no lumps remain, then stir with a wooden spoon constantly until the mixture begins to thicken. After 4 minutes, add the lemon juice and zest. Continue stirring rapidly, it will thicken very quickly once the mixture boils again. Remove from heat and place in a heat safe jar. Let cool on the counter, cover and refrigerate once cool. Make the Glaze: Heat the white chocolate chips and heavy cream together in a microwave safe bowl. Mine took about 30-45 seconds. Stir until smooth. Let cool while the danish bake. Make the Danish: Preheat oven to 350 degrees. Line a cookie sheet with parchment paper. Mix the Greek yogurt and sugar in a small bowl. Place about a tablespoon in the center of each square. Top the yogurt with about a tablespoon of lemon curd. Fold up the edges, pinching to seal the corners as much as you can. Transfer carefully to prepared cookie sheets. Bake about 8 minutes, until the crescent rolls are golden brown on top. Drizzle with the glaze. Cool before eating. I’m not sure of the carb count, but I would think a lot. The crescent rolls are full of flour, the yogurt and lemon curd have sugar. I’m not sure how you would substitute low-carb things…but if anyone else knows I hope they’ll chime in.